The one-of-a-kind jewelry pieces at Happy Go Licky are undeniably chic. There isn’t an inkling of a doubt that you will get a second glance or more when donning one of their silk wrap bracelets ($49.95). All of the jewelry pieces are handcrafted and can be personalized to suit your style. 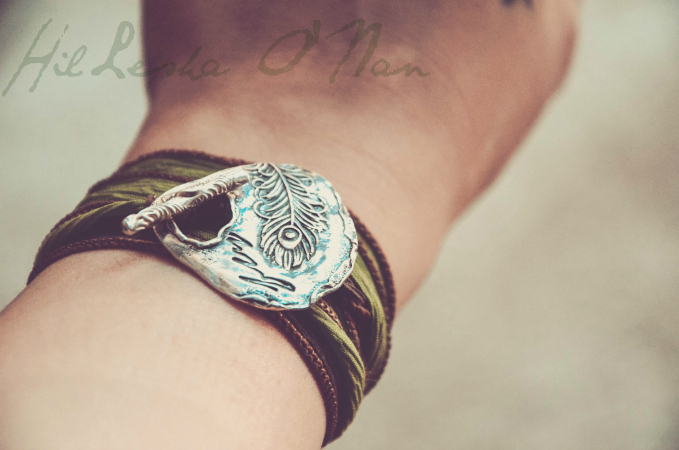 Their jewelry collection boasts silk wrap bracelets, leather wrap bracelets, necklaces handmade in sterling silver or eco-friendly recycled fine silver (99.9% pure), rings, and monograms. Choosing a bracelet from Happy Go Licky wasn’t an easy feat, because they have so many gorgeous bracelet styles that suit that my style! I’m particularly fond of bracelets when it comes to accessorizing, and they make up most of my jewelry collection. 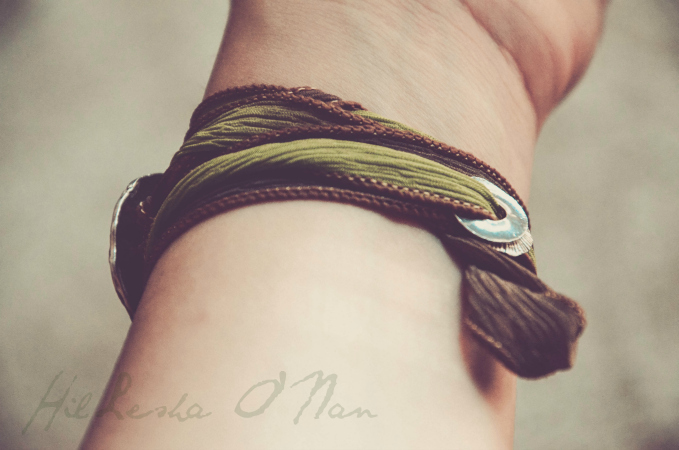 After careful thought and consideration, I finally opted for the the silk bracelet, featuring earthy tones of green and brown, which they refer as “seaweed” on their store, and it is adorned with a handmade sterling silver peacock feather toggle clasp. The colors and the peacock feather toggle clasp compliment each other beautifully. The peacock feather is embossed below the word “fly” with edges roughly hewn and sporadically pitted for an exquisite rustic luster. The bracelet is lightweight, yet makes a significant statement, especially if worn as a solo accessory. It’s so lightweight that it is easy to pack, thus making it the ultimate traveling accessory. What makes this bracelet extremely versatile and unique is that you can alternate with ribbons of other colors to match your mood or outfit. It is also very comfortable due to its adjustability. With that being said, one size fits all! Happy Go Licky offers 30 styles in 16 ribbon colors that are always kept in stock ready for prompt shipping. Place silver piece on top of wrist. Wrap ribbon around wrist as many times as it will go. Customize the fit by tying knots along the ribbon if needed. Push bar through hole in clasp to secure. It should fit comfortably snug, but not tight. If knot end pokes out of the hole, simply tuck it back to hide. Untie toggle pieces. Then, slip the disks off ribbon. String them on new ribbon. Gently tie toggle pieces to ends of the ribbon with one simple knot through wire loops. These are uniquely beautiful. I love how there is a combination of different ribbon colors. That silver piece is very pretty too. This looks so pretty, I know my girls and I would love this shop! That is beautiful. I would love to own a piece! That is so cute I love it. Would look great with many different outfits. Thanks so much for featuring our HappyGoLicky Jewelry Silk Wrap Bracelets. It looks great on you! I love jewelry, especially bracelets and that is gorgeous! How pretty! I love handmade jewelry. No two pieces are ever identical so you know you have a one of a kind piece. Love jewelry like this. It is so laid back yet still chic! Kathleen recently posted..Plan a Summer Party for Under $100! I hadn’t heard of Happy Go Licky jewelry before. I love this silk bracelet. That is such a pretty piece. I love the rustic look. That bracelet is adorable, I need a few! That is such a fun bracelet! I’d love one for myself. Very chic! I love that it’s a simple statement but looks very comfy too. I am not a huge jewelry wearing girl… but do like it. And, I love that bracelet. Cute, and looks like it would be one I could wear. I hate dangly stuff, it gets in the way.